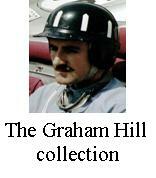 Since having that terrible accident at Watkins Glen in 1969 Graham Hill’s career had lost something of it’s sparkle. He still had many wins but his top flight career was effectively over. A spell with Rob Walker was followed by two seasons with Brabham where he had his last F1 win in the 1971 non-Championship International Trophy at Silverstone driving a Brabham BT34 "lobster claw". Unhappy at Brabham, Hill announced he was starting his own team for 1973. He would be driver-owner of Embassy Racing. Embassy sponsorship helped Hill buy Shadow DN1 chassis’ with Cosworth engines but the partnership proved pretty fruitless. 9th place at Zolder was the best finish and then it was last of those still running. For 1974 Hill invested in Lola chassis, this brought a better season from the point of view of more races finished and generally in higher positions but only once did Hill manage a top six finish. He continued with these cars into 1975 until the new Andy Smallman designed GH1 car was ready. Hill drove the car only twice, and after failing to qualify for the 1975 Monaco Grand Prix (a race he had won five times), Hill withdrew from driving to concentrate on running his team and mentoring his new young protégée Tony Brise. Guy Edwards was the regular driver and stepped up to lead the driving team while Rolf Stommelen came in for a few races only to be put out of action by an awful crash in the Spanish GP that left 4 spectators dead. Alan Jones then took over the second car for a few races, and finished fifth place in German Grand Prix. Brise came sixth in the Swedish Grand Prix and qualified sixth for the Italian Grand Prix. 1975 was starting to look better for Embassy Hill racing until 29th November 1975. A foggy night saw Hill and a large portion of his team killed in an air crash on Arkley Golf course. Scale Racing Car's kits have progressively improved from those they released at the start of the company, but then, model kit manufacturing technology has moved on at a very rapid pace in the last 15 years or so. This kit is one of the early ones and Ian built it in the late 1990's. 1/43rd scale manufacturers now have the benefit of photo etch technologies and CAD-CAM manufacturing, all a far cry from the days of hand made masters like this kit was created from. Before anyone thinks I'm suggesting this isn't a great kit I am simply putting it in context with the era of it's creation. Personaly I enjoyed making these simpler models as a break from more complicated. in depth, larger scale models and there is enough detail to make an interesting model. Halfords acrylic car paints have been used for the body colour and a mix of Humbrol enamels and Citadel acrylics took care of the detail work. The real issue with making white metal models is they can get rather dirty during the cleaning up process. Be sure not to breath in or in any way ingest the metal filings or dust. One thing you can do is planish the bare metal so it shines. This helps get a more realistic chrome effect than painting, but it can dull again over time so it is best to put a high qhality clear varnish over the metal to protect the finish.